The Waterloo Historical Society actively collects documents important to the history of Waterloo Region. This archival collection includes maps, photographs, newspapers and textual records. The collection is housed in the Grace Schmidt Room of Local History at the Kitchener Public Library. The Society welcomes donations to this ever growing collection. Please see our guidelines for donations and bequests. Access digitized photographs from our archives in the WHS Photograph Collection. 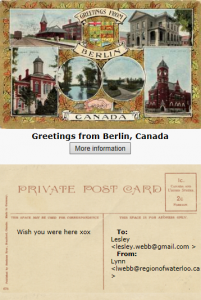 Find an image you like and send it as an electronic postcard! For more information on the WHS archives please call (519) 743-0271, ext. 252 or email our Archivist and Kitchener Public Library Local History Librarian, Karen Ball-Pyatt. The Waterloo Historical Society gratefully acknowledges its ongoing partnership with the Kitchener Public Library. The Society has kept its collection and archives in the Library since the founding of the WHS in 1912.